Last year, Richmond Civic Theatre announced that it was one of a handful of community theatres that did not miss the opportunity to nab performance rights to oh, I can’t stand it….Les Miserables. Ever since, I have been trying to contain my “estaticness” and resist the temptation to act as crazy as some of my theatre friends who have Instagrammed, Twittered & Facebooked all manner of fanaticism since before the movie was released in December. Y’all are ridiculous. And I love it! I have been preparing myself mentally to audition for Madam Thenardier. I know I can sing the part (I sound fantastic in the van) and the character would be a blast to play! People who know me know I would have fun with it. I purchased my soundtrack CD, picked up audition materials, YouTubed the piece to rehearse and wrote audition dates on the calendar. This was going to be a once in a lifetime thang, ya know? As the audition dates have approached, I began to feel conflicted and wasn’t sure why. I’m not afraid of auditioning. I’ve done it before, had fun, got a part, had a blast with Pirates of Penzance! I’m ready to do it again. 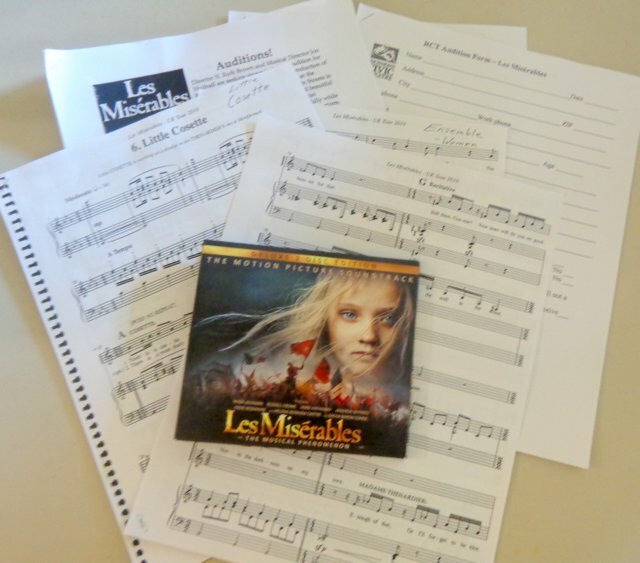 Recently, I was listening to my Les Mis soundtrack and the youngsters were around so I skipped “Master of the House” because it has “bad words.” It hit me that, even if I were to get the part of Madam Thenardier, my little kids would not be able to see me in the play because of language and heaviness of subject matter and, if they were to see it, I would have to justify to them why it’s okay for mommy to use “bad words” simply because they are being sung and fit the character. Wow. What was I thinking? True, the language suits the character but it doesn’t suit mine. Another time last week, little 3 year old Seth was sitting on my lap in the evening, as he usually does, and the thought hit me that I would be missing several months of our evening routine of cuddling. No biggie to the theatre or the rest of the world but it means everything to Seth in the evening. Especially since we started our catering business, I have to be gone sometimes during the day. Then it was time for lullabies. Seth likes to hear the one I wrote for him, “Teach Me Lord” or “Deep, Deep” then his lullaby is followed by Isaiah’s regular, “Amazing Grace.” That, too, would not be happening for awhile as I know a rigorous rehearsal schedule is in store for those who get parts. Then there’s the hilarity that emanates from the kitchen when the kids are doing dishes in the evening or my huge homeschooling, business-owning, catering to-do list. BUT, I’ve been telling myself, this is a once in a lifetime chance! It was from the deep recesses of my mind that that phrase re-emerged from the past. I heard it on TV. It was Regis and Kathy Lee. Yes, I used to watch the show on occasion. On one particular show, Kathy Lee was talking about how she was going to be hosting the Miss America or some other Pageant and, in order to fit the dress she wanted to wear, she was weaning her baby. Say wha? She was weaning her baby to fit a dress. Why? Her words still ring in my ear; “It’s a once in a lifetime chance.” I remember thinking, “Isn’t being your baby’s mommy a once in a lifetime chance?” So here I am, struggling with my once in a lifetimes, looking at each of them and, while I think working with the people at the theatre is fabulous, my little ones are precious and I have to be away from them enough as it is when we cater. I was able to do a play before because we didn’t own a business…that changes things quite a bit!